Give your lawn a make over after an interesting summer! 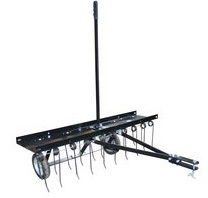 This 40 inch de-thatcher encourages lush growth by allowing air and nutrients to more efficiently reach the root system of your lawn. Suitable for towing behind most lawntractors. Delivery of this item is FREE to mainland UK destinations. Delivery normally next working day, if order processed before noon, but please allow three working days.